A teenager from Greater Manchester had her sight saved after her optician spotted a sight threatening condition during a routine eye test last October. 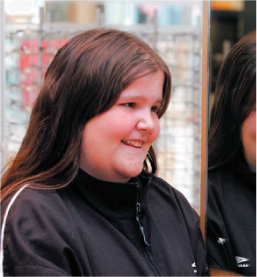 Siobhan Shine,14, from Bury, was suffering from an intercranial hypertension which her doctors were unable to diagnose. Siobhan’s symptoms included sickness, headaches, blurred vision and tiredness. Siobhan is a spectacle wearer but she noticed her pains became worse when she wore her spectacles. Her mother took her to the opticians for an eye test and to try contact lenses to see if this would ease her daughter’s symptoms. Siobhan was examined by optometrist Jonathan Brook at Yates & Suddell’s Bury Practice. Part of the eye examination was performed with a retinal camera which is one of the most technologically advanced eye examination devices available. The camera works a bit like a powerful digital camera taking detailed and full colour pictures of the back of the eye. Mr Brook said: “Siobhan was quite withdrawn and was responding badly to light as I examined her. I used a camera to enlarge the area. Her optic nerves were enlarged in both eyes and her blood vessels were expanded. Siobhan’s GP sent her to Fairfield Hospital, Bury, for tests for a suspected tumour but results revealed that Siobhan’s optic nerves were swollen so badly she would have lost her sight permanently without urgent treatment. She had a spinal tap to drain a build up of fluid behind her eye. She has gradually made a steady recovery and has now been given the all clear. Her mum, Maria, said: “She’d been poorly for weeks but all the medical tests came back OK. Then my husband saw an advert for the contact lenses and we thought we’d send Siobhan for an eye test to see if that would help. “We’re so grateful to Mr. Brook for spotting straightaway what was wrong. Now if anyone is suffering from persistent headaches I always tell them that seeing an optician is just as important as seeing a doctor. It was for Siobhan.